Suzanne from Philadelphia reporting for duty; 10 days of lovely Chicago and all it’s tourist joy is waiting for me! 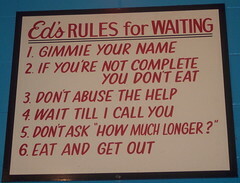 The other thing I have no shame about is going to Ed’s and taking pictures. Because…well, the only thing more amusing than the rules at Ed’s (::sigh::) and the bitter waitstaff (yeah, sure) is seeing girls in ill-fitting clothing with Starbucks Double Venti Mocha-Cappa-Frappo-Minta-Chino-Juice-Chai acting like everyone waltzes around the city with an American Girl bag. I want to shake them and ask where they learned what cool meant. Welcome to Chicago and to the blog! Any big plans while you’re in town? I have a hot date with Toulouse-Lautrec. On Wednesday. And a few of my friends who grew up in the area are taking me out to dinner a couple times as well. Aside from that, it’s making it up as we go!